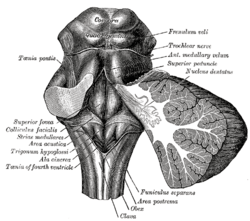 In the upper part of the medulla oblongata, the hypoglossal nucleus approaches the rhomboid fossa, where it lies close to the middle line, under an eminence named the hypoglossal trigone. Fourth ventricle. Posterioe view.Deep dissection.